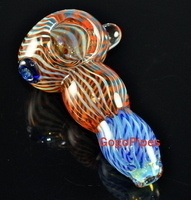 Pros: big bowl, beautiful colors, nice hits, thick glass, very easy to clean. Cons: not too great for just personal use, otherwise none. Comments: I was uneasy buying this at first because of the bright blue near the mouth piece but that part came in black which made it far more beautiful than expected. I've dropped it on hard floor and it didn't leave a scratch. Worth the price.